Transform lives with our Make-A-Wish partnership! Utomik is thrilled to announce its newest partnership with Make-A-Wish International! We are very excited to help Make-A-Wish transform lives! 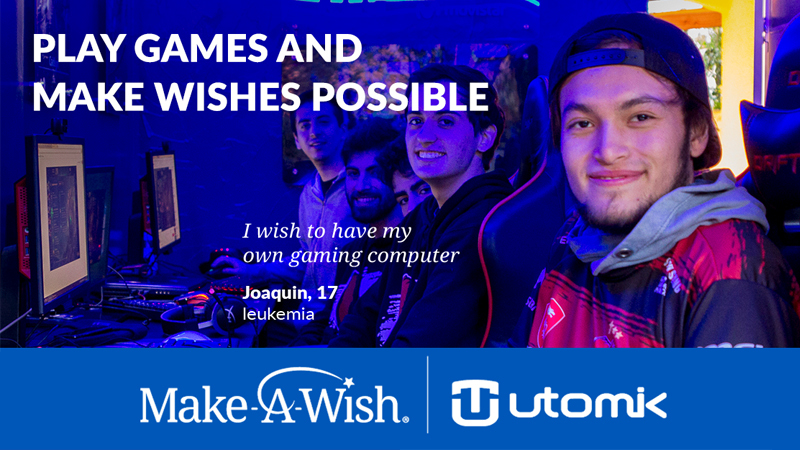 As part of these efforts, Utomik has donated family subscriptions to enhance gaming-themed wishes, offering wish children and their families the opportunity to play 900+ games' worth of new experiences and worlds to explore. Wish children around the world connect to their friends and momentarily escape from their treatments by playing video games while fighting for their lives. You can help support Make-A-Wish, too! Starting today, when you subscribe to Utomik via https://gaming.utomik.com/make-a-wish, your subscription will support Make-A-Wish International through an initial donation of 5EUR, but also an ongoing donation from your subscription every month! Let's work together in bringing life-changing wish experiences to children with critical illnesses around the world!